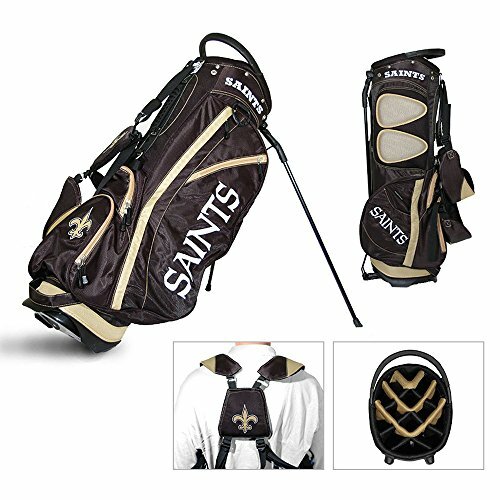 637556318282 NFL Team: New Orleans Saints Features: -Stand bag. -Official NFL team league. -Lightweight and full featured. -Including integrated top handle, 14-way full length dividers, six location embroidery, five zippered pockets, and two lift assist handles. Product Type: -Stand Bag. Lightweight: -Yes. Color: -Black. Color: -Red. Color: -Blue. Color: -Green. Material: -Fabric. Generic Dimensions: -Overall dimensions: 35'' H x 9'' W x 11'' D. Dimensions: Overall Height - Top to Bottom: -35 Inches. Overall Width - Side to Side: -9 Inches. Overall Depth - Front to Back: -11 Inches. Overall Product Weight: -6 Pounds.